Michael Korstick ranks among the most important German pianists of our time. His playing is documented on numerous award-winning CDs which bear witness to the enormous breadth of his repertoire. 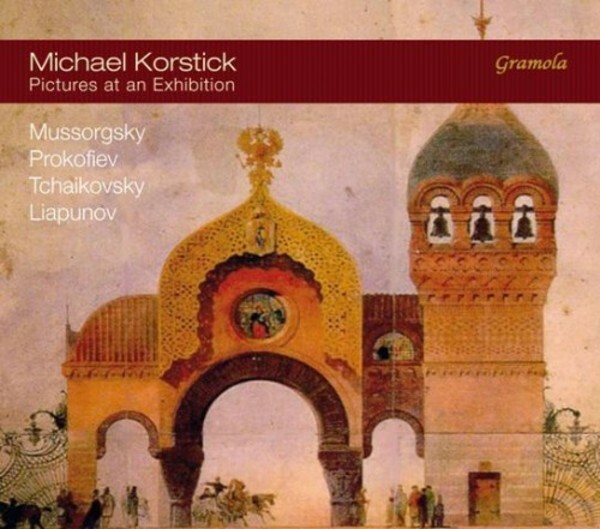 The recording now being released by Gramola features Russian piano music from the 19th and 20th century. The piano cycle Pictures at an Exhibition by Modest Mussorgsky can rightly be viewed as one of the most well-known works for piano, not least due to the immense number of later orchestrations (most notably by Maurice Ravel). Following up on the programmatic nature of musical pictures is the Doumka (Sc�ne rustique russe) in C minor, Op. 59 by Piotr Ilyich Tchaikovsky as well as the Caucasian Lesghinka by Sergei Lyapunov, who alike portray traditional Russian themes and musical motifs in many of their compositions. Less tangible in extra-musical content appears the Sonata for piano No.8 in B flat major Op.84 by Sergei Prokofiev, having been composed during the years of World War II from 1939-1944.